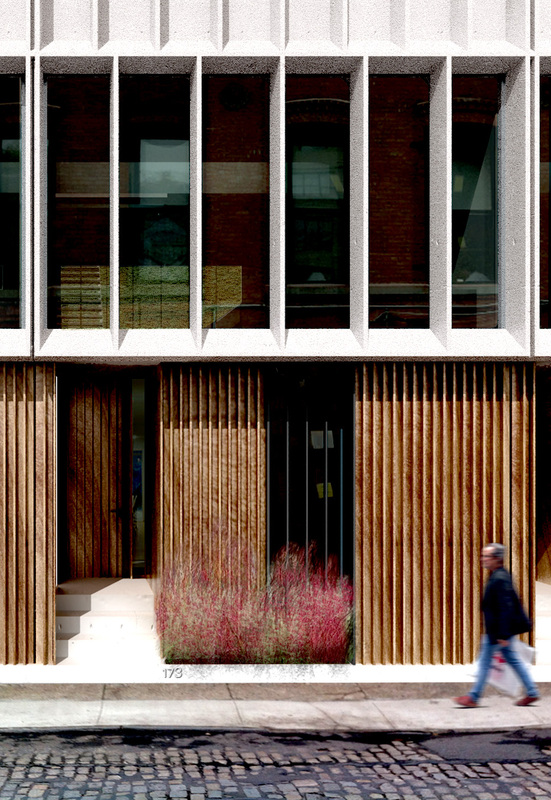 Rendering of 55 Pearl Street entrance. Image Courtesy: Alloy Development. Proposal garners high praise from Commissioners after reduction in visible height, revisions to alleyway entrance. 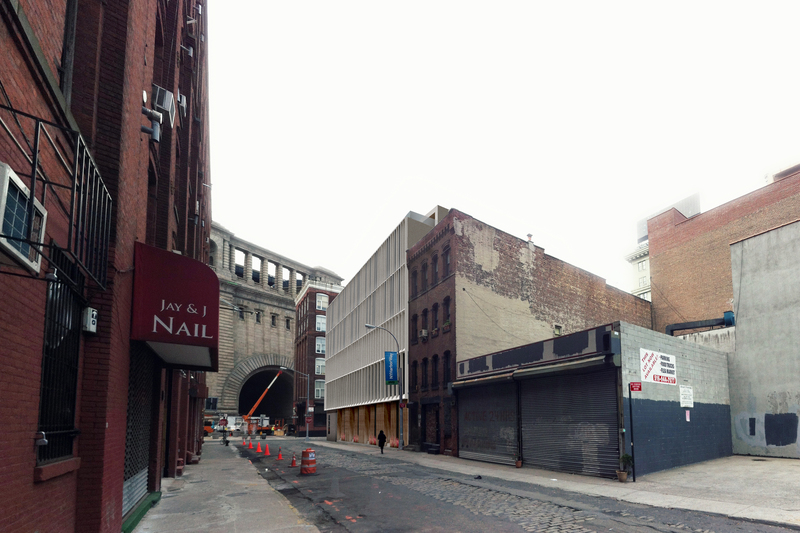 On March 12, 2013, the Landmarks Preservation Commission voted to approve a proposal by Alloy Development to construct a five-story residential structure where a garage now stands at 55 Pearl Street in the DUMBO Historic District. The corner-lot building will house five individual townhouses with entrances on both Pearl and Water Streets. The project will total approximately 3,000 square feet. Commissioners originally considered a proposal for the site on February 5, 2013. (See CityLand coverage here). At the hearing, preservationist organizations objected to the bulk of the proposed structure. A representative of the DUMBO Neighborhood Alliance asserted that the existing early-20th-century garage building should be preserved in some form. Commissioners found the scale generally appropriate, but objected to the design of an “alley” on Pearl Street that would serve as a garage entrance, and asked for further design refinements. Architect Jared Della Valle presented the original proposal and announced a number of revisions to the proposal at the March 12th hearing. As the original plan proposed, the building would be clad primarily in wood on the ground floor, while the glass facade of the upper stories would stand behind a pattern of ductile concrete fins. Della Valle produced a sample of the concrete material that would be used for the one inch thick fins on the upper stories and used the sample to demonstrate the “warm palette” of the planned building. In the revised proposal, a one-story screen at the sixth story street wall, which served to protect a setback penthouse from noise, was eliminated. This modification would reduce the apparent height of the building and bring the building into closer alignment with the corner line of nearby buildings. The entrance to the alley would be set back from the street wall and utilize a gate rather than a garage door. Additionally, the sidewalk in front of the entrance would be restored with historic cobblestones and the ground-floor windows would feature cast-iron grilles. Rendering of 55 Pearl Street proposal from Water Street viewpoint. Image Courtesy: Alloy Development. Commissioner Fred Bland, who supported approval of the previous iteration of the project, called the proposal one of the best he’d seen in his tenure as commissioner. He praised the “ravishing” materiality and ingenuity in creating a contextual form for townhouses in DUMBO. Commissioner Margery Perlmutter praised the plan as a successful example of designing a contextual building in a historic district “in a completely contemporary language.” Perlmutter found that the fins recalled the brick colonnades of historic industrial architecture and said that the concrete grid over glass was reminiscent of the district’s window patterns. Commissioner Joan Gerner commended the project as being “playful,” while speaking to the industrial character of the neighborhood. Chair Robert B. Tierney described himself as “particularly pleased” by the restoration of cobblestones and led a unanimous vote for approval. LPC: 55-57 Pearl Street, Brooklyn (13-9538) (March 12, 2013) (Architect: Alloy Development).